With social media, smart phones, digital photography and ubiquitous Internet access – even in the most remote places – never before has it been easier to log your travels and share trips with followers. Not only can we share as much as we like about our travels on the ‘net – often with anonymous strangers in blogging and on Twitter – but we can get tips on what to do and feedback on what we’re missing. The great thing about the way we travel in this day and age – apart from the endless online resources and literature available – is the amount of connections we can make. Not only can we easily find the people we want to meet more easily, but they can find us too. And it’s the personal connections in travel that we at Hejorama are interested in highlighting. But we’re interested in both the energy and experiences between travelers that happens face to face – in the traditional spirit of travel – and in the way they come to meet and stay in touch. 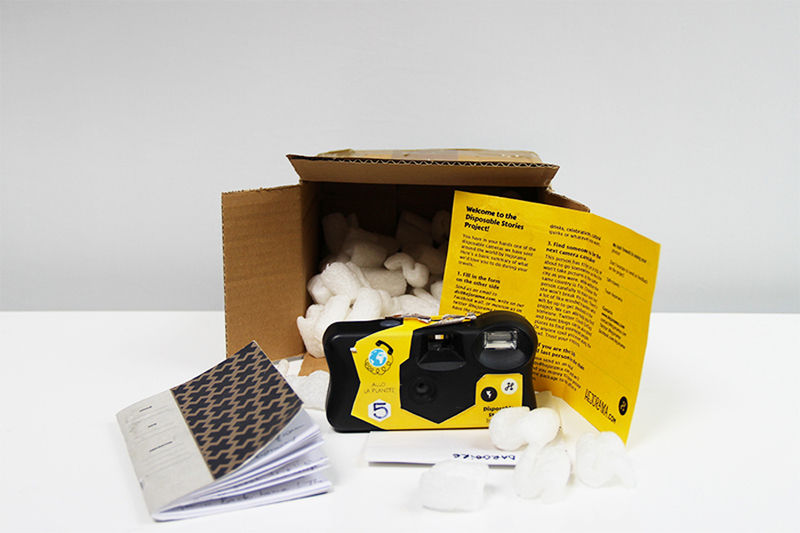 So, a basic idea: we’re giving disposable cameras to travelers who want to start a trip chain. The first person takes a few photos of their travels, and then passes the camera along to someone they meet along the way who is heading in a different direction and wants to continue the chain by documenting their travels and passing the camera along. And while the connection between the travelers will hopefully be shared in blogging and social media for everyone who follows, the end result of the camera’s trip and the images captured on it will be a complete surprise to all in the end. We’re also sending out Hejorama notebooks so the travelers can tell us about their trips, and explain the pictures we’ll find on the cameras. 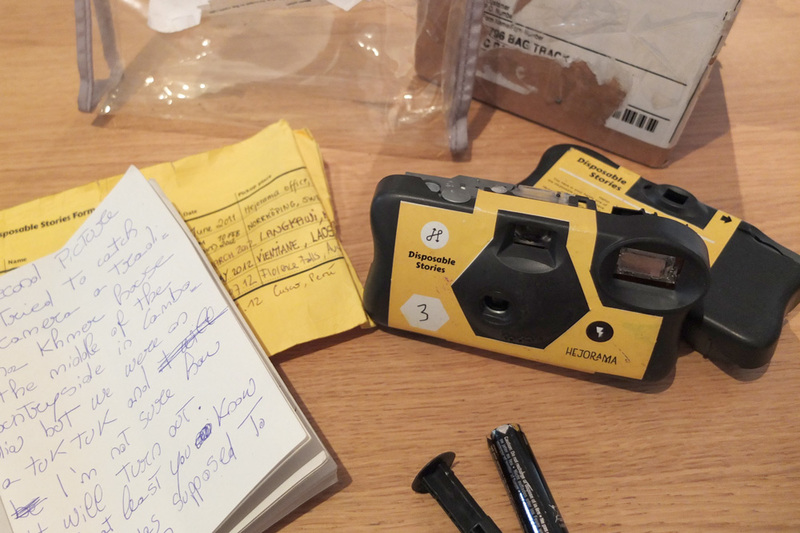 And when the cameras and travel notebooks start coming back to our HQ – we’ll share each trip with everyone in detail online – and have an exhibition to continue growing the project, which anyone can attend in person or interact with online. The new age of connection! Both modern and traditional! 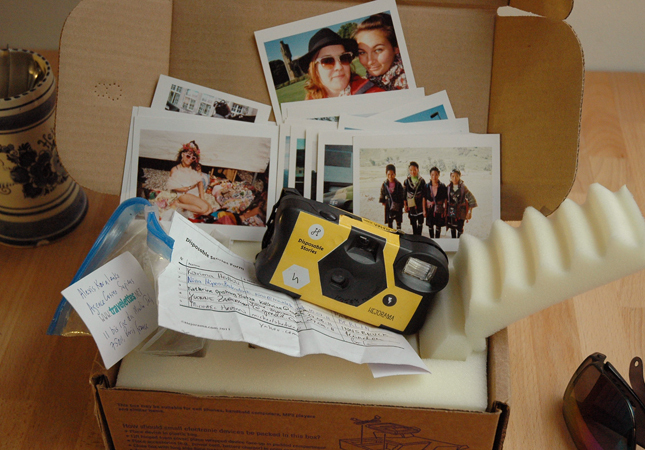 If you would like a camera to start a trip, write to us! Or, meet one of the Hejorama team in Paris, Riga or Toronto… and we’ll see what we can do! We got the first camera back! Check the photos of camera n°4. We got a second camera back! Check the photos of camera n°5. We have started a Kickstarter project to fund a relaunch of the project on a bigger scale. Join in! Yessss! The Travelettes definitely want one! I want one! I’ll send it around Thailand and SE Asia. Um, this is pretty much fantastic. I’ll be in Paris mid-October…too late for a disposable? Great idea! I’m going to Paris September 4th and would love a camera! I’ve passed camera #2 to someone in Latvia! LOVE the idea! Did this once with a disposable camera a friend of mine gave me just before leaving on a RTW. Would love to join if you have any left. There are currently 8 cameras spread out around the world. Most of then we are not sure where though. As far as we know there’s one in Norway, one in Indonesia, one in NYC, two in Canada, one in Eastern Europe. So we hope to have fun surprise when they come back! Great idea, we’re going to Québec in October, so if we can get one, we would love to participate to this project ! I’m travelling around the world for 8 months and I’m sooooo disappointed that i haven’t heard about that before ! Arghhhh. So jealous. What a great, great idea! So excited to see what comes of this! Plano Itinerante definitely wants one! I Will be in San Francisco in September and Victoria BC in June! Let me know :-) I would love to participate! You know what would be EVEN more awesome. 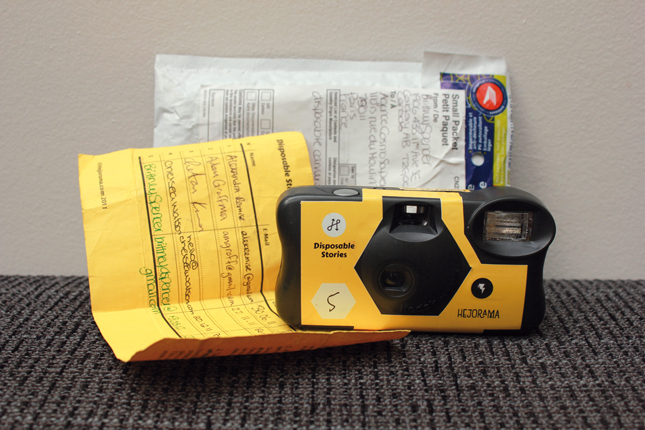 Disposable (or cheap) video camera. But a GoPro might get stolen. It’s great to read something that’s both enjoyable and provides prdtsagimac solutions. Simply wish to say your article is as astounding. The clarity in your post is simply cool and i can assume you are an expert on this subject. Fine with your permission let me to grab your feed to keep up to date with forthcoming post. Thanks a million and please continue the gratifying work. With everything that appears to be developing within this particular subject matter, a significant percentage of viewpoints tend to be very exciting. Nevertheless, I appologize, but I can not subscribe to your entire strategy, all be it stimulating none the less. It seems to everyone that your opinions are actually not entirely rationalized and in actuality you are generally your self not entirely certain of your argument. In any case I did take pleasure in reading it. SamuraiThis is one area that I’m a bit backwards.In many ways, I’d rather my kids not see me when I’m very old. I like the idea of them remembering me while I’m still fast and strong…Hopefully, I’ll have saved enough money that I can take care of me and my wife without being a burden on them.I also hope that I keep my wit about me, so when they do decide to visit, I can still talk intelligently to them. Je suis entiÃ¨rement d’accord avec le commentaire ci-dessus, l’Internet est un doute de plus en plus dans le milieu le plus important de la communication Ã travers le monde et sa raison Ã des sites comme celui-ci que les idÃ©es se rÃ©pandent si rapidement. Katharina Love your card, let us know how you do in the contest. Would love to see the entrants. Is there one spot they post them all? Helene is soooo kind to donate the stamp. Thanks for the inspiration.